Members of the TWMLA team recently presented at the Annual New York State Association of Transportation Engineers (NYSTATE) Conference held in Lake Placid. Principal Kathryn Wolf and Senior Landscape Architect Jonathan Peet co-presented a session, “The I-81 Viaduct Project: Urban Design Approaches to Meet the Project’s Second Goal,” that described the urban design work TWMLA is currently doing for the I-81 Viaduct Project in Syracuse, New York. TWMLA’s involvement in the highway infrastructure project relates to matters of context, livability, visual quality, sustainability, and economic vitality. A second session was presented by TWMLA Senior Landscape Architect Zac Boggs; “Graphic Communication in Landscape Architecture.” His presentation included the theory of graphic design, the standardized workflow process between computer programs, the value of hand graphics and examples of plan and perspectives renderings. 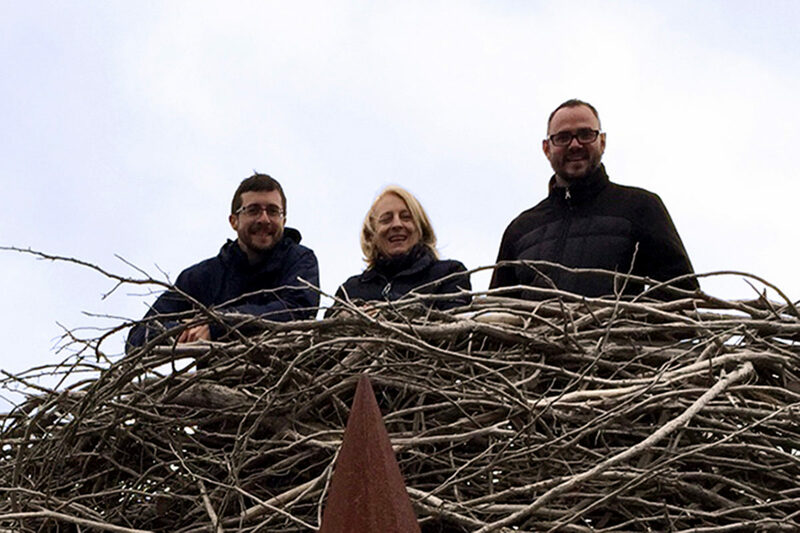 Image: Following the NYSTATE Conference, TWMLA’s Jonathan Peet, Kathryn Wolf, and Zac Boggs visit the newly completed Wild Walk at The Wild Center, which offers visitors the rare opportunity to climb into a bald eagle’s nest.